You're on an airline going from point A to point B and the worst has happened -- unfortunately, one of the pilots on your flight dies, as what happened on an American Airlines flight from Phoenix to Boston. What happens next? In every instance, an emergency is declared and the remaining pilot takes over operations of the flight. The first thing to remember is that both the captain and the first officer are fully qualified and trained to fly an aircraft alone in case of an emergency. The captain has rank, but both pilots share equally in their flight duties, including take-offs and landings. 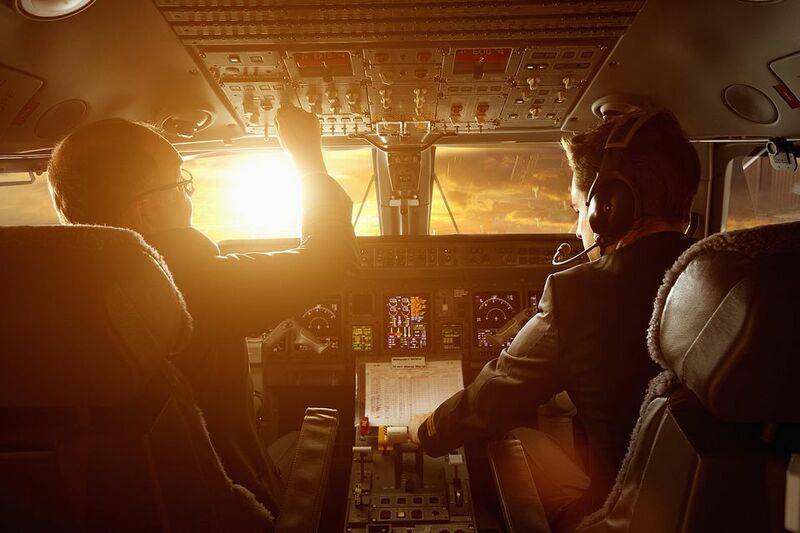 But in the case of an emergency that incapacitates a pilot, the remaining pilot would probably want someone in the right seat to help with things like checklists, set tasks that happen during every flight. The flight attendant would make an announcement asking if there is a pilot onboard. It's likely that a commercial pilot flying as a passenger would be aboard a flight, and he or she would go into the cockpit to help the remaining pilot on duty. If no commercial pilot is available, then there would be a call for anyone with a pilot certificate. If that isn't an option, then a flight attendant would sit in the right seat, having been offered some training to handle an emergency. The remaining flight attendant crew may prepare for an emergency landing, depending on how far the aircraft is from its final destination. Federal Aviation Administration (FAA) regulations were amended on January 15, 2002, that would allow a flight attendant to enter the cockpit if one of the pilots become incapacitated. The operational requirements found in § 121.313 were also amended on January 15, 2002, to require each airline to establish methods that enable a flight attendant to enter the cockpit in the event that a pilot becomes incapacitated. This isn't the first time this has happened. In 2009, the captain flying a Boeing 777 Continental Airlines flight from Newark, New Jersey, to Brussels, Belgium, died of a heart attack in the cockpit and the co-pilots took over the flight after a doctor onboard was unable to revive the captain. The flight continued and landed without incident in Brussels, with the passengers none the wiser until they left the plane. Back in 2007, another Continental Airlines flight from Houston to Puerto Vallarta, Mexico, made an emergency landing in McAllen, Texas, after the captain died at the controls. In 2012, the captain of a Czech Republic flag carrier CSA Czech Airlines died during a flight on an ATR turboprop from Warsaw, Poland, to Prague, where it landed safely. And in 2013, a United Airlines Boeing 737 flight flying from Houston to Seattle was diverted to Boise, Idaho after the captain had a heart attack in the cockpit. Doctors on board tried to save him, but he later died in a local hospital. After the crash of a Colgan Air flight outside of Buffalo, New York, in 2009, the FAA required pilots to have an Airline Transport Pilot (ATP) multi-engine certificate and at least 1,500 flight hours. The agency now also requires pilots to have at least 1,000 as an airline first officer before flying as captain. In the end, U.S. commercial airline pilots -- whether they are captains or first officers -- have years of training and thousands of hours of experience, so in the rare cases when one dies in the cockpit, they are fully qualified to fly the plane safely and without incident, so passengers should feel safe when flying.